(Top, clockwise: Jing Abalos as Batman and Dante Rivero as Dracula; Jing Abalos as Batman; Nort Nepomuceno is after a victim; Batman (Jing Abalos) and Ruben (Rolan Robles). 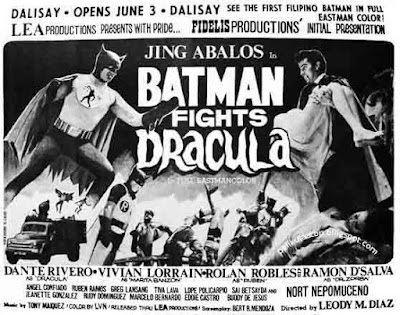 BATMAN Fights Dracula which will be shown at the Dalisay Theatre starting today, June 3, is Fidelis Productions' initial film presentation in full eastman color directed by Leody M. Diaz. The story is about a mad scientist Doctor Zorba (Ramon D'Salva) who is at his wit's end because of the interference of Batman (Jing Abalos) in his smuggle tries. 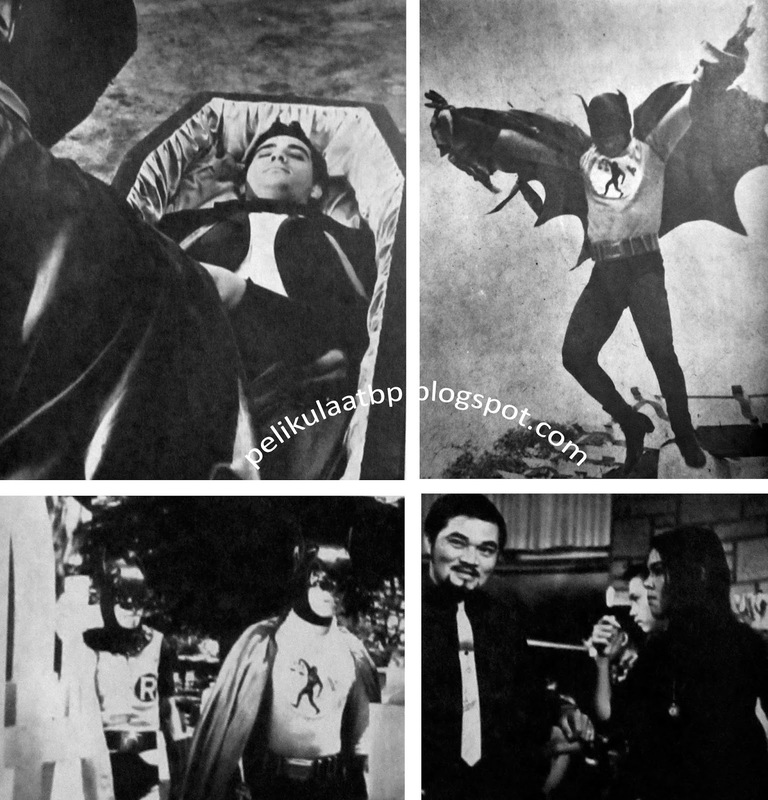 Together with his mad fanatic follower Turko (Nort Nepomuceno), they hatch a plan to bring Dracula (Dante Rivero) back to life by means of electronic knowhow which makes him different in that he can be controlled and is not afraid of the Cross. 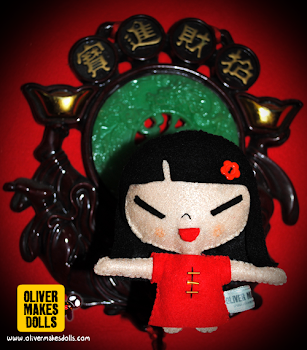 In a hidden laboratory in a cemetery mausoleum, they perpetuate their evil deed by getting fresh blood from their victims. 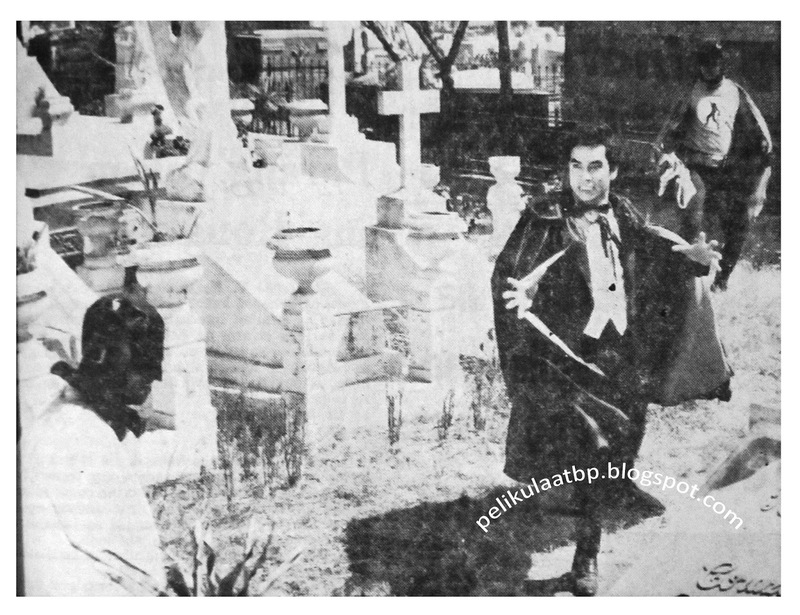 Dracula comes to life. 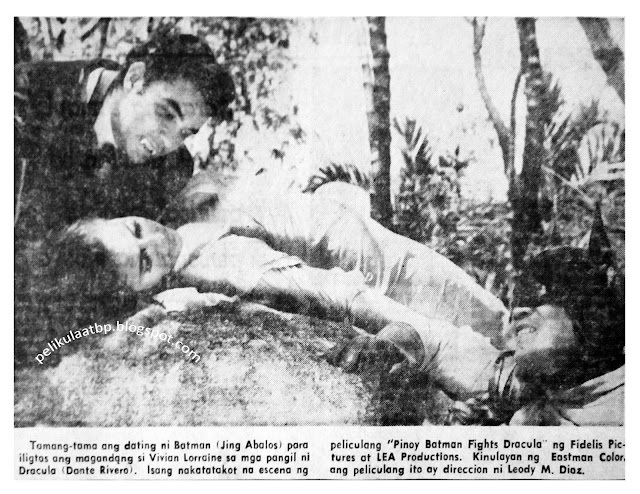 Marina Banzon (Vivian Lorrain), the daughter of another scientist helps Batman solve the mystery of his powerful foe Dracula for which she is held captive. Learning the secret of the ultra-ray sunglasses worn by Dr. Zorba and his men, Batman raids their secret hideout and saves his lady fair. 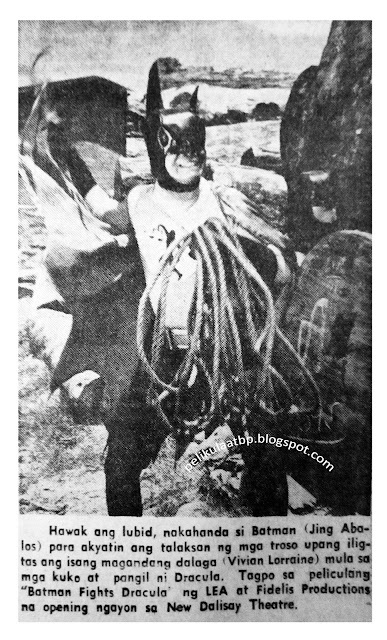 Too, he turns Dracula to kill the very men who created him. 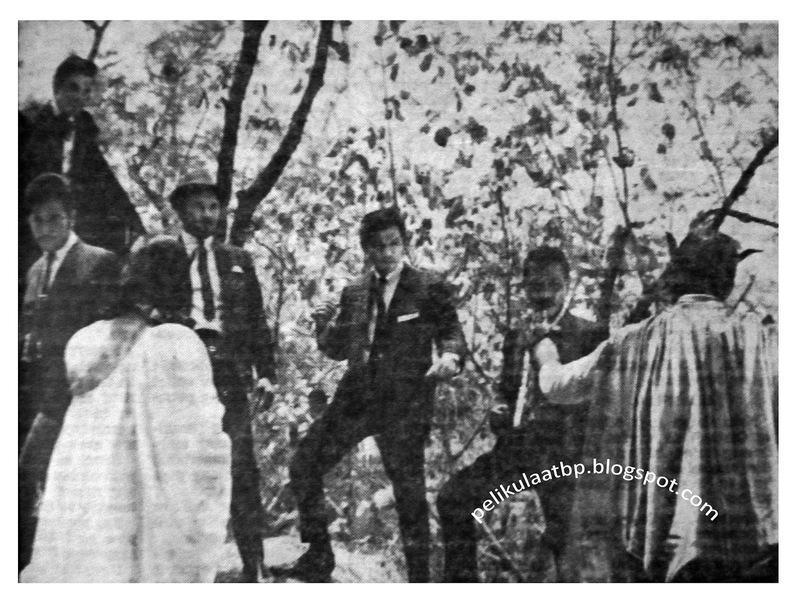 Bakit kaya nakangiting lahat ang mga star na ito ng Fidelis Productions na sina Jing Abalos, Vivian Lorrain, Dante Rivero at Rolan Robles? 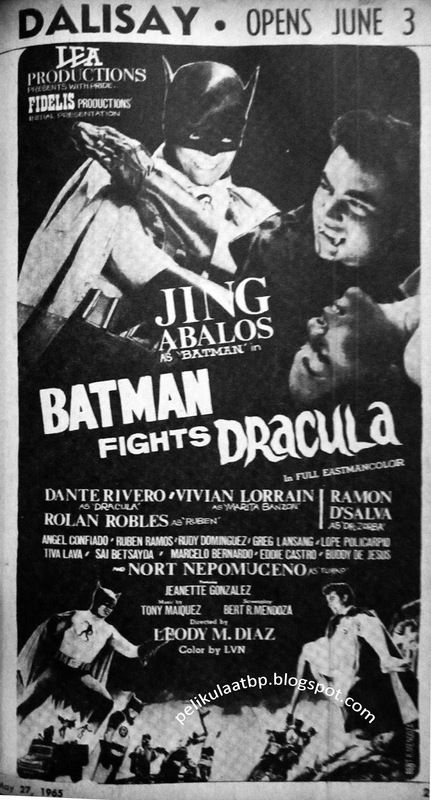 Ang pelikula ay Pinoy Batman Fights Dracula. 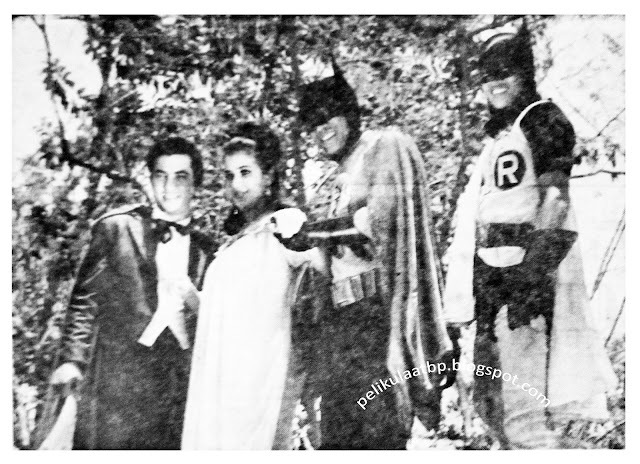 Nasukol nina Batman (Jing Abalos) at Ruben (Rolan Robles) ang nakatatakot na si Dracula (Dante Rivero) sa hideout ng huli sa isang sementeryo. Isang makapigil-hiningang eksena ng pelikulang Pinoy Batman Fights Dracula ng LEA Productions at Fidelis Productions. Kinulayan ng Eastmancolor, ang nagdirihe sa pelikulang ito ay si Leody M. Diaz. 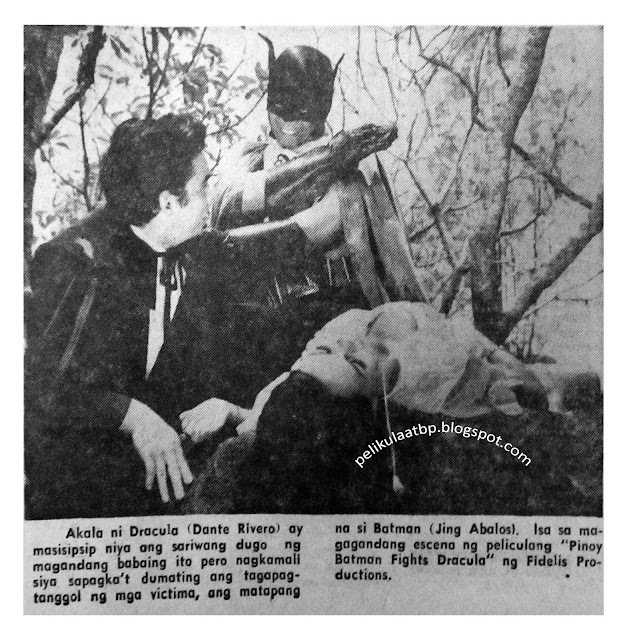 Nasukol ni Dracula at ng mga tauhan ng sindikato sina Batman at Ruben sa eksenang ito ng Pinoy Batman Fights Dracula ng Lea Productions.